Postage Print Impressions Labels or PPI labels are perfect for when you are sending large quantities of mail. PPIs are the simple alternative to time intensive postage stamps and franking machines. Discounts are offered to users of PPIs, similar to that of franking machine users, and you can use PPIs on UK and international postage. 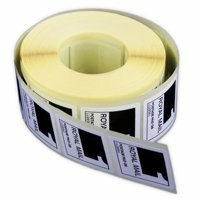 StickyLabels.com can take away the chore of printing, by printing the labels for you. What could be easier? Welcome to the new way of mailing. You simply set up a PPI account with Royal Mail, obtaining a PPI Licence Number unique to you, which is needed when ordering PPIs. StickyLabels.com can print PPIs for you. This takes away the hassle of printing, frees up more imperative time for you to complete more productive tasks, and ensures professionally printed PPIs. This eliminates the risk of printing malfunctions and ensures all of your mail correspondence is sent in a visually professional manner. PPIs can be printed onto labels, paper, envelopes of all sizes, or wrapping, for optimum flexibility. What specific options do I have when sending mail via PPI labelling? 1st Class, 2nd Class, Economy, Royal Mail 24 and Royal Mail 28 services (Including ‘tracked’ options and ‘signed for’ options), Advertising Mail, Advertising Mail with Response, Sustainable Advertising Mail, Publishing Mail, 1ST & 2ND Class Account Mail (Parcels), Royal Mail Special Delivery Guaranteed by 9am (Also 1pm option), Business Airmail, Business Surface Mail, International Tracked and secure services, International Mixed Mail, International Letters, International Flats, International Packets, International Signed For, International Destination Sort and Airsure. PPI is the efficient way of sending mail, why not make the process even simpler by allowing StickyLabels.com to take out the chore of manual printing? Please get in touch if you have questions. We’d love to help!